The wonkier parts of the blogosphere are all alight with the story of one Ed Snell, a veteran harasser of pregnant women at abortion clinics, who was allegedly thrown off a car from which perch he was "counselling" women, and seriously injured. "He got what he deserved!" a clinic receptionist was alleged to have screamed. There's no trace of this incident in Google News, other than a second-hand report from a Catholic house organ and another from the far-right Newsbusters.org, proving once again, of course, the existence of a widespread anti-anti-abortion conspiracy. A web search turns up several such second- and third-hand reports, all of which can be traced back to one source: the American Society for the Defense of Tradition, Family and Property. 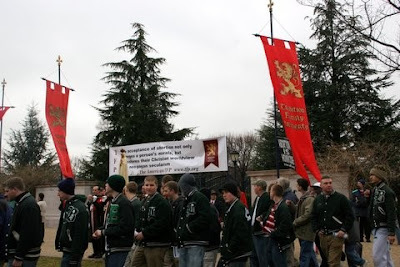 The American Society for the Defense of Tradition, Family and Property (TFP) was born of a group of Catholic Americans concerned about the multiple crises shaking every aspect of American life. Founded in 1973, the American TFP was formed to resist, in the realm of ideas, the liberal, socialist and communist trends of the times and proudly affirm the positive values of tradition, family and property. I have blogged before about the dalliance that elements of the conservative movement are presently having with neo-Nazis and their assorted kindred. This marks the first time that I am aware of, however, that a fascist organization has actually planted a news story, retailed, as it turns out, by its very own assistant web editor, and had it picked up uncritically by various extreme elements in the conservative blogosphere to attack the pro-choice movement. Useful idiots--or willing collaborators? Further discussion on the invisible wall that supposedly separates fascism from conservatism is welcome, as always. Something did happen in front of the clinic, it seems. At last one of the "MSM" has broken their collective vow of silence and reported. Left unexplained is how the young man managed to "scale" an eight-foot fence, land on the car roof and push the right-to-lifer to the ground. (Why didn't he just use the door?) As the facts come out, perhaps at the young man's trial if there is one, I suspect we'll be hearing another side or two of this story. None of this contradicts my earlier point: that a lurid tale of alleged pro-choice violence from a suspect source was leaped upon in an utterly uncritical fashion by people who are looking for anything, anything at all, to distract our attention from the killings, arsons, bombings and assorted vandalism perpetrated by the, uh, "pro-life" movement. Moral equivalence? I don't think so. This page contains a single entry by Dr. Dawg published on December 30, 2007 11:31 AM. Bring it on, Kate was the previous entry in this blog. Harper's hair is the next entry in this blog.